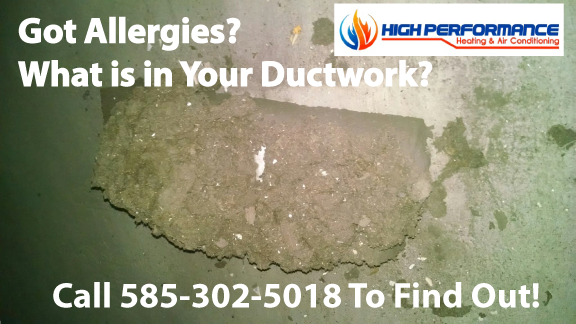 Ductwork Can be Dirtier Than You Think.. Your Air Ducts are Probably Dirtier than you can Imagine. Air Ducts collect particles and debris from the air in your home and bring it, ideally, back to your furnace filter be be collected and removed. However, just like you dust your furniture and throw away the junk, it is not all collected by the filter and ends up in your ductwork. That means, that you, as well as everyone else will breathe that nasty junk.Your duct system is the lifeline to the air in your home. Rochester is in full bloom as the temperatures are rising and we make our way into the hot, muggy, sticky heat of summer. Allergies are starting to get worse, and so is the indoor air in your Rochester home. With all the summer projects and activities that are done during the summer, you’ll need our professional Air Duct Cleaning Rochester trusted HVAC contractors will help you start breathing easier and healthier. When spring rolls around, most people start to open more, if not all of the windows in their home, trying to bring in fresh air. Along with that fresh air, pollen and other pollutants will also come in, entering your vents and air ducts, getting trapped in the dust that resides in your duct work. It can also follow the air down your duct work and into your furnace. When the weather starts to become unbearable, you’ll close all of your windows and turn on your Air Conditioning unit. Which will recirculate the air that is in your home over and over. Making it very import to keep your duct work clean and free of pollutants. Especially if you suffer from allergies or suffer from continuous sore, scratchy throats when your HVAC unit comes on. It could also be a cold winter night, and you’re having a furnace emergency at the worst possible time. Shout “HAROLD.” The Boiler gives out, shout “HAROLD.” You want to understand more and compare different types of water heaters. Shout, or maybe just say nicely, “Harold.” I think you see my point. 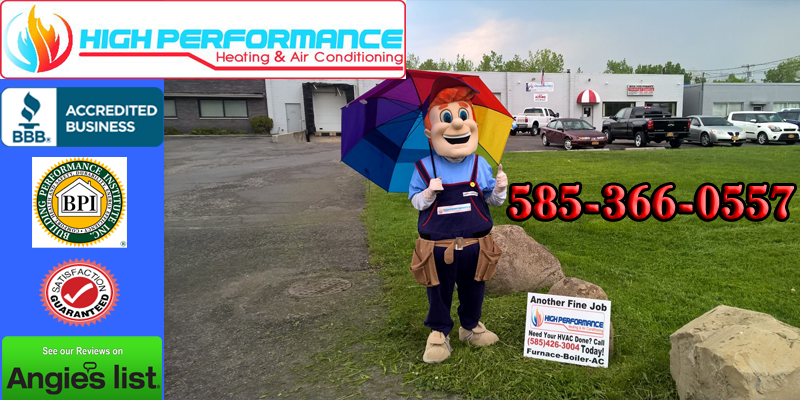 The thing is Harold will come to your rescue when you him, and Harold leads the “High Performance Heating & Cooling” Team. Not only do we offer you the best expertise on boilers for the region, but we help answer any questions you might have regarding HVAC; to help you come up with the best decision regarding what you may need. Just tweet your questions to @HighPerHVAC or call us at (585) 3-HAROLD. Remember, the next time your furnace needs repaired, your air conditioner needs replacing, or your questions need answering, Call HAROLD, and the High Performance Team will be there to help. What do You Do about Your Allergies in The Spring A Season. Call Today for and Advanced duct cleaning and our crew will help you breathe easier. Our crew does a complete and though cleaning when it comes to your ductwork. We protect your house and your property as well as help you breathe easier. Our Hepa filtration system will reduce dust, pollen, mold, and spores while helping you and your family enjoy the pleasure of having less cold and/or flu like symptoms. Imagine if your basement floor was never cleaned, or if your bookshelf was not dusted in years, This is Why you need happy harold and the crew to perform an advanced duct cleaning in your home. The debris that is inside your ductwork, and we have seen everything from toys and clothes, to dead rodents and bugs, will cause breathing and other respeeritory problems that will be there forever unless you treat them. Our advanced duct cleaning will access the inside of your duct work and, using a high powered suction and an advanced air knife to slice that debris out and your ducts will be clean and efficient, increasing the air quality in your home. When you are going green, you aren’t just helping the environment, you are helping your bottom line. The green in your wallet will multiply as you “green up” your home and the systems that keep it comfortable. One of the systems you can green up and enjoy savings as a result is your air conditioning system. Everyone likes tax credits. Tax credits mean more money in your wallet at tax time. Did you know certain appliances and home systems qualify you for tax credits? You can also invest in ENERGY STAR appliances for a little extra money and savings. The newest A/C (air conditioning Rochester NY) home systems are much more efficient and can give you the ENERGY STAR savings you have heard so much about. Another simple way to go green and save green is to install a programmable thermostat. Leaving your thermostat on the same temperature you think is most comfortable, then going out for the day to work and school is a waste. Sure, your dog and cat may feel nice and cool, but to have the air conditioning running to keep an empty house nice and cool while the sun is beating down on it and no one is home is just a waste. You can simply have a programmable thermostat installed and it will make sure the home is comfortable before you come home from work without wasting energy all day. As we creep in between summer and winter, it may be time to give the whole house air conditioning system a break most days and think about making sure the heating system is ready to fire up on that first cold night. While you have this break in constantly running one system or another, now may be the perfect time to invest in having an air duct cleaning done. All of the dust, debris and allergens that settle in and cling to the ducts in your home go unseen; but their affects do not go unnoticed. You Should Call for a Duct Cleaning Today.Having all of that dirt and debris build up and then blow out into the air you and your family has to breathe can lead to any number of problems. Anyone in the home who has breathing issues, respiratory issues of any kind or have allergies can be affected negatively by what is blowing through the air. It is impossible to see for yourself exactly what is going on inside of the vents in your home. That is where our duct cleaning Rochester home service can be of benefit. We can go in with our equipment and actually see what is there. Any company that tells you they can clean your ducts without actually being able to show you what is there or that it is finally gone is not worth the time and money. We can give you an actual glimpse of what is building up and ensure that it is completely gone when we are done. If you keep up with air duct cleaning services on a regular basis, you may notice your heating and cooling systems actually work much better. Having to push air through dirty ducts actually puts unnecessary strain on your systems and can shorten their lifespan. When you compare the cost of a duct cleaning each year to replacing a tired and overworked air conditioning system or furnace, the choice is easy. A duct cleaning service is worth every penny! Do You Need to Invest in Vent Cleaning? There are just certain responsibilities that come with owning a home. You may already keep up with maintenance of vital systems, but how about other systems that may fall to the wayside? If you have never had a vent cleaning service or you can’t remember the last time you did have the vents in your home cleaned, you really need to call High Performance Heating, Cooling and Hydronics for service soon. The vents in your home function to carry all of the air you breathe throughout the house. While you ensure that the air pumping through your home is the perfect temperature, many people don’t give too much thought as to what may be in the ducts that the air is flowing through. As time goes by, dirt, dust and other allergens build up and actually coat the inside of the ducts you use. As the air pumps through, this dirt and debris gets chipped away and blows out with the air. The problem lies in the fact that you can’t see what is in the air that is being pumped into the rooms of your home. Yet, all of that dust and allergens can sure cause many problems even though it is typically out of sight. The best defense against these unseen allergens and build up of dirt is to have regular vent cleaning. Vent cleaning can not only make the air you and your family breathes a lot cleaner, having clean ducts can save you money. If your ducts are clogged and there is a significant build up of dust and dirt, your heating and cooling systems will have to work harder to push the air through. Having the vents cleaned annually can reduce the strain on your heating and cooling systems, which can help their overall lifespan. Do right by your ducts and schedule a vent cleaning service before the season ends. There is never a wrong season or time of year to reap the benefits of having your air ducts cleaned. For air duct cleaning Rochester area home and business owners trust and rely on is only a phone call away. High Performance Heating, Cooling & Hydronics is the professional duct cleaning specialists to get the job done right any time of year. When you do not get your home or businesses air ducts cleaned regularly, there are a wide range of issues that can crop up and affect the entire heating system or cooling system. If left unchecked, ducts that are clogged or lined in dust, dander, chemical residue, allergens, or other debris can lead to poor air quality. Air duct cleaning Rochester homes have performed translates to cleaner air in those homes and businesses. Without being cleaned, the forced air naturally picks up those particles and releases it through the ducts for you and your family to breathe in. If anyone in the home has respiratory issues, such as asthma or allergies, the constant exposure to this less than clean air can worsen these conditions. Regardless of how many air fresheners, air purifiers, or expensive filters you invest in for your heating or cooling systems, if your ducts are dirty, the air in your home will be too. Air duct cleaning Rochester homes invest in with High Performance Heating, Cooling & Hydronics is also beneficial to the operation and the life span of your heating and cooling systems. When the ducts are unclean, the system literally has to work harder to force the same amount of air through. When the system works harder, it costs more also. You may find yourself paying more while the system performs less. You also run the risk of the heating or cooling system dying out on you much quicker than expected. The last thing you may need this holiday season is the added expense of repairing or buying a new heating system because unclean ducts put too much of a strain on the system. The air quality of your home matters, especially during the winter when everything is closed up. And, the cost to heat your home and keep your heating system running smoothly matters also. The best thing you can do this winter to improve the air in your home and the cost of heating it is to invest in air duct cleaning Rochester residents can trust. Turn to High Performance Heating, Cooling & Hydronics.